When the property owners on historic South Central Avenue (from Washington Boulevard to Vernon Avenue) started one of the first Business Improvement Districts in South L.A., I was surprised to be elected president of the group’s board of directors. I never thought we’d have a business improvement district here. I never thought I’d be running our family’s dry-cleaning business on South Central either. But South L.A. has a way of surprising you. The growth and success we’re experiencing are raising new questions for residents and businesses alike. For example, how do we continue to grow and still preserve what we have? How do we attract new businesses so residents can access conveniences in their own community? And at the same time, how do we make sure that the local mom-and-pop businesses that have been part of our growth don’t get pushed out by the likes of CVS (coming soon) or Trader Joe’s (rumored)? I’m sensitive to the concerns of the mom and pops, because I am the mom in one—as were my mom and my grandmother. My parents, Alice and Horace Bowers, purchased Smith’s Cleaners from my mother’s parents in 1950 and renamed it. Originally it was on the corner of Westlake Avenue and Temple Street in the Westlake District, and it grew quickly, though the cleaning was done by a subcontractor. In 1964, my parents purchased a small dry cleaning plant at 2507 South Central Avenue. Bowers & Sons then became a “full service” cleaning operation servicing downtown Los Angeles and surrounding areas from two locations. The Bowers’ served retail and wholesale clients and provided pickup and delivery services. As the business grew, my parents purchased an adjoining building (2509) for expansion. Eventually, they bought the entire block of storefronts on the 2500 block of Central Ave., now Bowers Retail Complex. Like many families who own their own business, my brothers and I worked at the store. Each of us has held the helm of the ship! We’ve succeeded because we’ve adhered to the business philosophy coined by my parents—“We Care Enough to Add A Personal Touch.” We’ve also maintained the cornerstones of our business—professionalism, quality, reliability, and affordability. Additionally, we believe in being good stewards of our community and giving back to people in need and to community causes. My parents were always there to give financial, business, and even family advice, assistance or employment. My dad would often hire the men down on their luck to do general maintenance, like sweeping, mopping, or painting. Still, I wanted my own life and career. I married and had two sons, now wonderful young men. For over 20 years I worked in retail sales and management and then as an account executive at Kaiser Permanente, where I earned a good salary, full benefits, and five weeks annual vacation. In 1994, my parents decided to retire. My dad wanted to close the doors and sell, unless one of their children would take over the plant. Neither of my brothers, who both managed the plant previously and were well into their desired careers—one was a writer, the other an actor-singer-performer—wanted to take it over. Nor did I.
Vivian Bowers-Cowan at Bowers & Sons Cleaners. Alas, I decided I couldn’t stand the idea of the building going into decline and adding to the community’s blight. My thinking was this: If my parents had succeeded and stood the test of time, I would also. Besides, I’d always enjoyed working in the community and providing a good service. Many people asked me why would I take over a business in South Central and give up my career. I answered, why not? I was a single mother, and it was 1994—just two years after the riots—and the neighborhood was having a rough time. My sons, who had worked at the store, asked me not to take over the business, saying it was dangerous and “We’d starve!” But I felt the community consisted of good, hardworking people who deserved professional service. So, I put my faith in God, in the family’s reputation as pillars of the community, and in our location’s proximity to downtown, freeways, and USC. It’s a timeless truth that people will always need to get their clothes cleaned. Because this was post-riots, I essentially took on two, related struggles—one for the business, the other for the neighborhood. In those first years, I saw drive-by shootings, drugs, and prostitution. At one point I thought about installing bullet-proof glass! Initially, we had only three employees and there were days the business made little more than $200. I wanted to develop a business plan, and my search for help led me to the Rebuild L.A. program, which referred me to USC’s Business Expansion Program. I completed the Fast Trac II entrepreneurial course, creating a working business plan that I put into action. Within three years, Bowers had grown over 75 percent, added two employees, and redecorated the lobby. Slowly, the neighborhood also improved. Community members began complaining to the council office and police department about the crime and lack of resources. In response, policing increased resulting in a raid of one of the largest dope houses in the area, which to my surprise was directly across the street. (There’s a bakery there now.) Shortly afterwards, Maxine Waters held a press conference on the corner of Adams and Central, declaring that we wouldn’t tolerate any more violence and unrest in our community. We didn’t. On our block, I had pay telephone stands used by drug dealers removed, while sweeping and repainting. I had a local graffiti artist paint a mural on the side of the building to discourage other graffiti. Residents and business owners developed neighborhood watch groups and worked with the Community Police Advisory Board. When the local police division moved from Newton Street, which was above Washington, down to 35th Street on the Avenue, the community welcomed their presence. But the biggest shift was the sea change of residents. South Central was largely an African American community. Over time, many of these longtime residents relocated to other areas of Los Angeles in search of employment and a better quality of life, some passed away, and unfortunately, some went to prison. By 1997 the area was 75 percent Latino and most of the small businesses along the South Central corridor were owned and operated by Latinos. I eventually added staff who were bilingual—I only had so much Spanish from my days at L.A. High. We also benefited from public and private investment and more attention from our city council office under the leadership of Jan Perry. The vacant lot in the block next to ours (once a super market) was acquired and developed as a mixed-use property with affordable housing and retail space on the street level. Several other senior and affordable housing units soon followed. 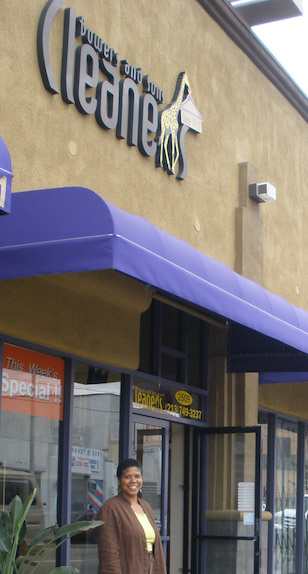 A shopping center with a grocery store and other services was developed on 20th and Central. A city moratorium on new fast-food places and liquor stores also created space for new kinds of businesses to develop. Councilwoman Perry built a constituent service center in the 4200 block of Central Avenue—a beautiful LEED-certified building with rooftop space that is great for public use. And our store and several other businesses took advantage of the city’s façade improvement program to beautify our storefronts. The rehab of the Somerville Apartments and of the Dunbar Hotel, the latter famous as a venue during South Central’s jazz heyday, also gave us a lift. Greg and I have become my parents! Location – and delivery – have seen us through. Our business succeeds because we are less than a mile from the growth and development downtown. We provide dry-cleaning and laundry service to lofts and private residences within a 10 mile radius, corporate clients such as the L.A. Music Center, Los Angeles Convention Center, MTA, various departments at USC, and the Department of Homeland Security. Today, more than 70 percent of our business comes from such routes. The other businesses in the Bowers Retail Complex are long-term tenants including a dentist, a soccer store, and a computer repair shop, which have all been here for more than 10 years. There’s also a tattoo supply store and a corner store, Amigos Variety, which has been there forever. The newest, A Taste of ChiBas Café, is my mom’s catering kitchen, which she now leases out to qualified licensed caterers. For several years, members of the Central Avenue Business Association worked on beautification and cleanliness, business growth and development, and safety and parking concerns. When we first discussed the Business Improvement District, it seemed like a strange idea. We were already paying taxes for these services, so why should we send more money to the city? When we researched other BIDs we realized it was a way to maintain high standards and reach our goals. In May 2014, we formed a steering committee, hired consultants, and started the 18-month formation process. The BID of property owners was officially established on December 6, 2015 with a 78.65 percent yes vote. We’ve already hired our Clean Streets Team to power wash the streets, remove graffiti, empty trash cans, remove bulky items, and weed the tree wells. By August, we will have our Safety Ambassador Team on board. Businesses on neighboring corridors have already begun to ask how they can develop their own BID! I’m thrilled with the BID. It’s added to what I call the improvement moment on the Avenue and in South Los Angeles in general. A variety of projects are currently underway. Meta Housing, which developed the lot next door, has another project in progress on Washington Boulevard. A Place Called Home, a terrific nonprofit focused on children and the arts, is expanding. The city has an interesting pilot program to help some of the small businesses here digitize their operations, so that it will be easier for them to grow. And I’m very excited about the new, very nice sit-down restaurant that should open early next year in the Hotel Dunbar. (Cross your fingers). Some things are becoming harder. Homelessness has become a much bigger problem in our area, as the development downtown pushes more people south. And there’s the concern that all the growth and development will displace both people and businesses. How do we welcome the new without pushing out the old? The good news is that on South Central, we are in a much stronger position to deal with these hard questions. 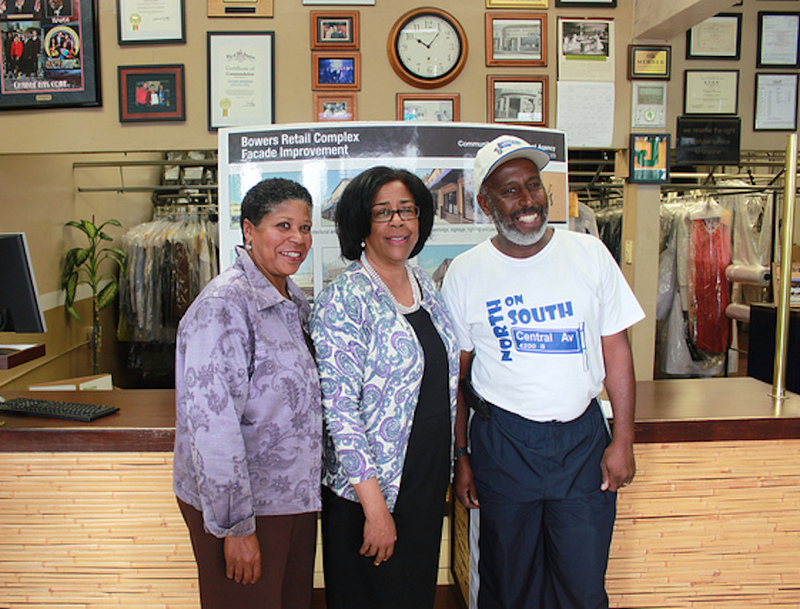 Vivian Bowers-Cowan is the President and CEO of Bowers & Sons Cleaners, a third generation, family-owned and operated, full service dry-cleaning plant established in 1950. *Photos courtesy of Vivian Bowers-Cowan.